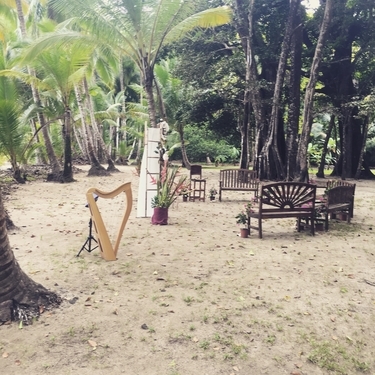 Devon Carpenter, harpist, is a professional harp player providing music for destination weddings in Turks & Caicos and throughout the Caribbean. The elegant music of the harp is the perfect addition to your wedding ceremony, reception, or party. Please book flights to arrive no later than 24 hours prior to the beginning of the ceremony to allow for airline or weather delays. Departure flight must depart no earlier than 12 hours after I finish playing. We will be in touch to discuss the availability of specific arrival and departure days and times based on my schedule. In lieu of checking the harp as baggage, you may purchase a seat for it to travel with me in the cabin of the aircraft. Ground transport vehicle must have a large enough cargo area to accommodate the harp in its flight case. It is preferable, but not required, that my hotel accommodations are at the same hotel or resort where the wedding is taking place. I submit all necessary visa and import documents; you are responsible for any visa fees and may be required to provide an invitation letter or other supporting documentation. If import duties will be owed on the harp, those will be discussed in advance. If fees are refunded upon taking the harp out of the country, those funds will be promptly reimbursed to you. Travel costs may be split between couples hosting their weddings in the same area around the same dates.